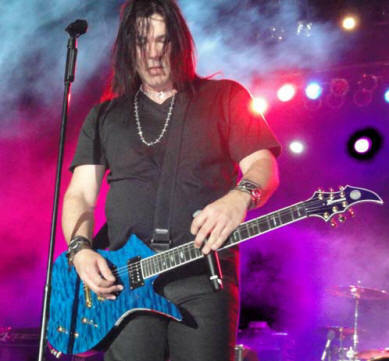 Mark Slaughter has worked with many famous musicians he has an amazing vocal range and we are very proud to present the Mark Slaughter guitar for your consideration. Prior to the formation of his eponymous band Slaughter, Mark Slaughter was the lead singer in the group Vinnie Vincent Invasion. Vinnie Vincent Invasion had a hit song, "Love Kills", that appeared on the Nightmare on Elm Street 4 movie soundtrack in 1988. 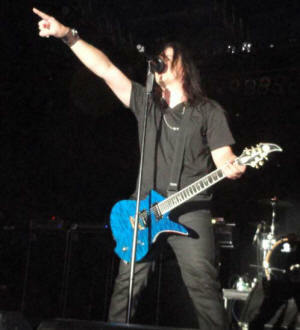 After the group disbanded in the late 1980s, Mark Slaughter, along with fellow Vinnie Vincent Invasion alumnus Dana Strum, formed the group Slaughter. Slaughter would go on to sell an excess of five million records in the 1990s.The group garnered a total of four Top 30 hits on the Billboard charts with tunes such as "Fly To the Angels" and "Up All Night", ]and toured with the likes of Kiss, Poison, Ozzy Osbourne, and Damn Yankees. Slaughter also works as a voice-over actor and composes music for television, movies, and sports outlets. Slaughter's current credits include the ongoing music compositions for Fox Sports, along with voice over ventures in productions like Batman Beyond, Bloodsport, and Animaniacs. Mark Slaughter & Ed Roman both have the same favorite charity, St. Jude’s Children's Hospital. There is a new project looming in Mark's future at the time of this writing. From what we have been told it will likely be the biggest thing in his illustrious career. We at Ed Roman guitars wish Mark the continued success that he so richly deserves. Mark Will Autograph It If You Like !!!!! 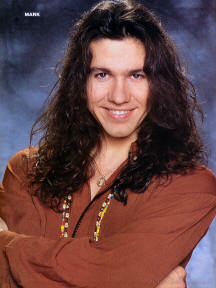 I Am Proud To Call Mark Slaughter A Personal Friend, We Are Both Very Passionate About Guitars. We Are Both Forward Thinkers & We Agree About All Things Guitar !!!!!! Why is Abstract different ? Choice & Personalization No company anywhere offers as many choices. Abstract Gold Series is a true custom guitar. I defy any other company to match Abstract in customization possibilities. 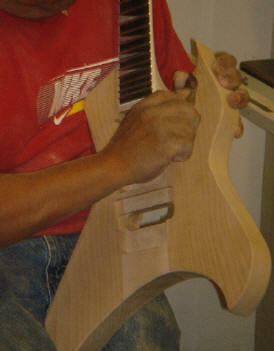 Many of these so called "Custom Shops" say they will build you a custom guitar as long as you stay within their limits. 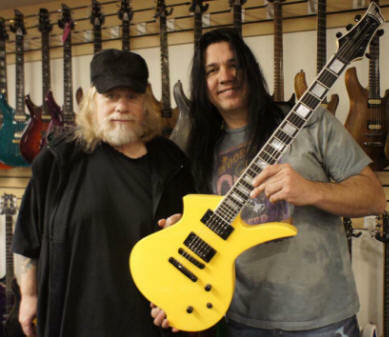 Sorry Charlie, Ed Roman doesn't call that a "Custom Guitar." The most stable & strongest way to build a guitar. Sustain from Hell, & tone to the bone. As only a neck through or deep set neck tenon will do. Choice of any scale, No Extra Charge. Choice of over 12 different fingerboard woods. Choice of any inlay from our extensive catalog or your own design. Choice of 22 Fret, 24, Fret, 27 fret 33 and 36 fret models available. Choice of headstock angle & tilt. Choice of width of nut. The widest choice of bodies available from any company anywhere. Choice of Multiple electronic Options such as Sustainers, Stutter switches, Tone circuits, Spring Loaded or Hard mounted Pickups. Abstract is different, Abstract offers more bridges & tailpieces than anyone in the industry. Most Models Available in any string combination you can think of. Anyone can Create & Design his or her own model & receive design royalties on sales. Abstract offers a prototype service for any young company that needs to hand build their first model. Custom Made Airline Transit Approved Cases at great prices.